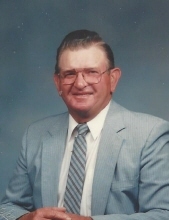 Charlie Clifton “Driver” Thomas, 94, passed away at his home in Blackville, on March 17, 2019. Mr. Thomas was born on November 27, 1924 in Cope, SC to the late Nathan B. and Lula Williams Thomas. He was a Veteran of the Army serving in WWII where he received the American Theater Service Medal, Eame Service Medal with 1 Bronze Service Star, Good Conduct Medal, and the WWll Victory Medal. He was a member of Calvary Baptist Church. In his past he served as a Deacon, Sunday School Teacher and helped with the maintenance at churchs. Funeral services will be held on Saturday, March 23, 2019 at 11:00AM in Calvary Baptist Church with Rev. Dean Deer and Rev. Dale Hutto officiating. Burial will follow in the Barnwell County Memorial Cemetery (Airport). The family will receive friends from 10:00AM until time of the service at the church. In lieu of flowers memorial may be made to Calvary Baptist Church of Barnwell. Mole Funeral Home is in charge of the arrangements. Survivors include his loving wife, Mildred R. Thomas of the home, sons, Donald Clifton Thomas (Beverly) of Orangeburg, SC, and John David Thomas (Mary) of Bamberg, SC, daughters, Sylvia T. Arnold ( Thomas Dale) of Greensboro, NC, and Jennifer Hope Thomas of Orangeburg, SC, daughter in law, Kathy Thomas of Bamberg, SC, 13 grandchildren and 27 great grandchildren. He was predeceased by a son, Tony Glen Thomas. To send flowers or a remembrance gift to the family of Charlie Clifton "Driver" Thomas, please visit our Tribute Store. "Email Address" would like to share the life celebration of Charlie Clifton "Driver" Thomas. Click on the "link" to go to share a favorite memory or leave a condolence message for the family.